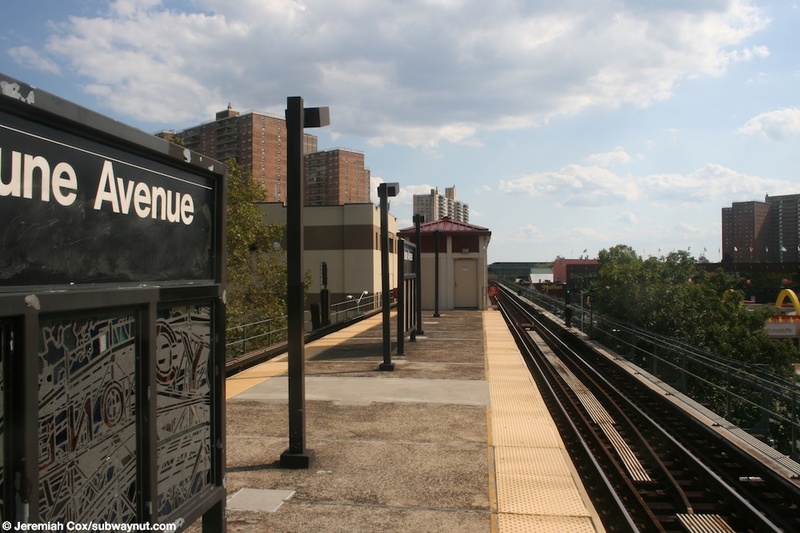 Neptune Avenue is a station on the Culver Line, and the only intermediate one that has only two tracks (It is true that there are only two tracks for the Culver Line at West 8 St-NY Aquarium, and Coney Island, but those stops are shared with other lines). 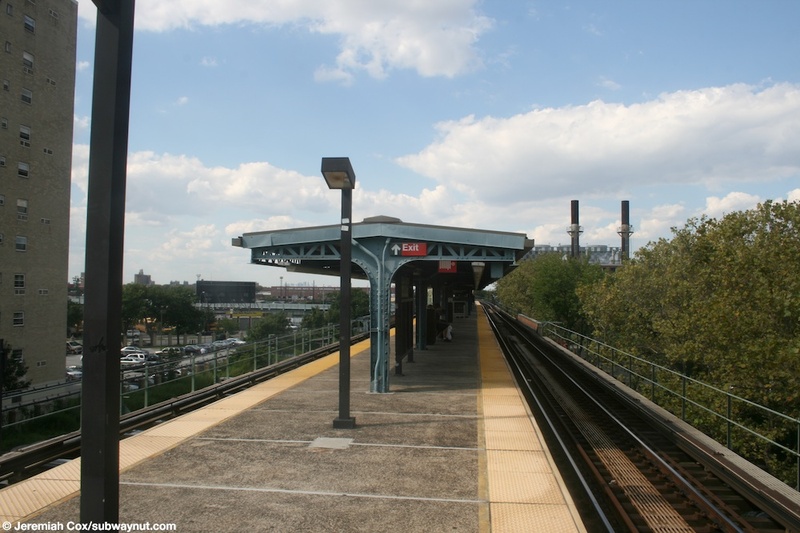 The station has a single island platform to serve this function, and the station was completely rebuilt when it was closed from 2002 to 2004 for Stillwell Avenue Reconstruction reasons. 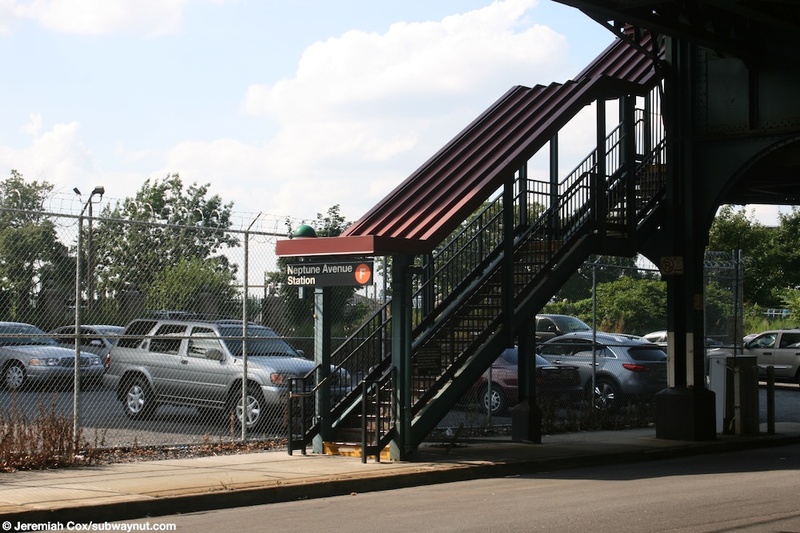 This means it has the design features of a modern elevated station. 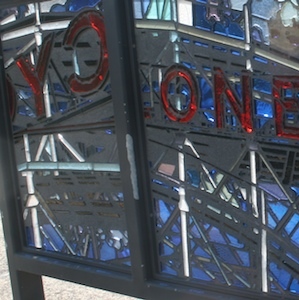 Most of the station's platform is exposed to elements, with tiny windscreens beneath the Neptune Avenue Station signs, many of witch have stained glass artwork inside of them. 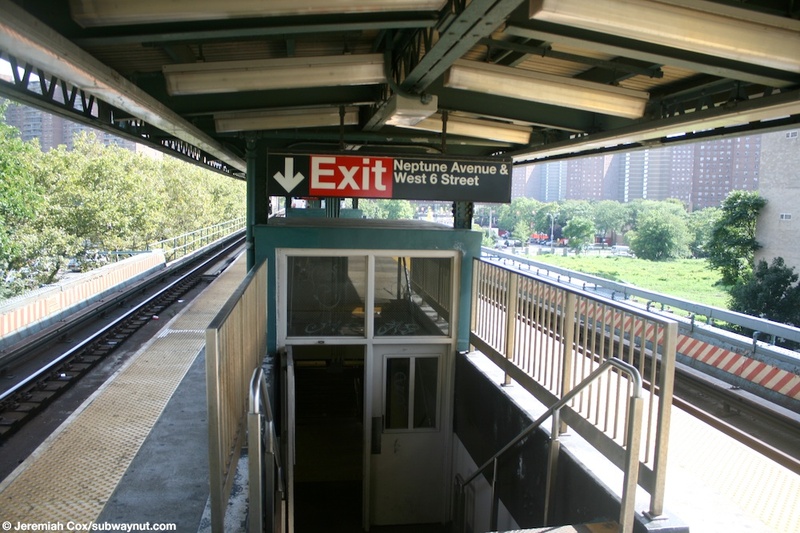 Towards the middle of the platform it is canopied, this is also where the two staircases lead down to the stations small headhouse area, that is nestled beneath the tracks and where a single bank of turnstiles, as well as a High Exit Turnstile to provide faster access, to the stations two exit staircases on eitherside of West 6th Street, just north of its intersection with Neptune Avenue. 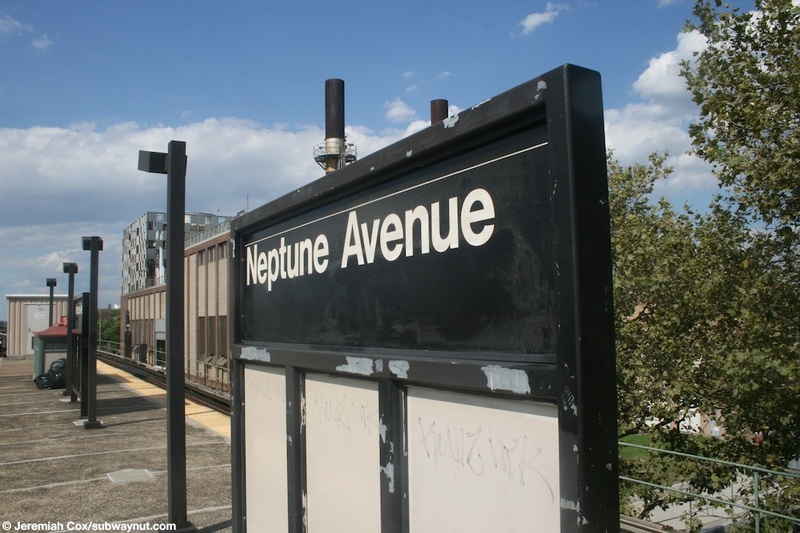 (neptunef1) A Neptune Avenue Station sign on the top of a platform windscreen. 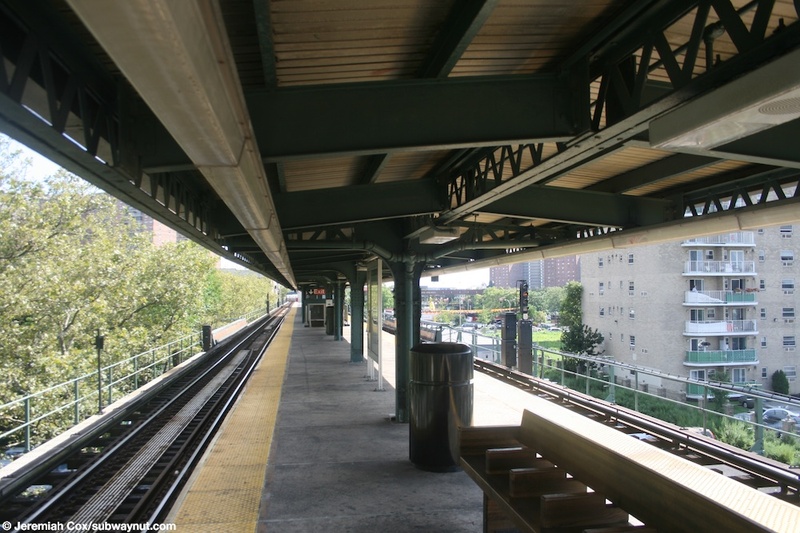 17 August, 2008 (neptunef2) Looking down the canopied portion of Neptune Avenue's single island platform. 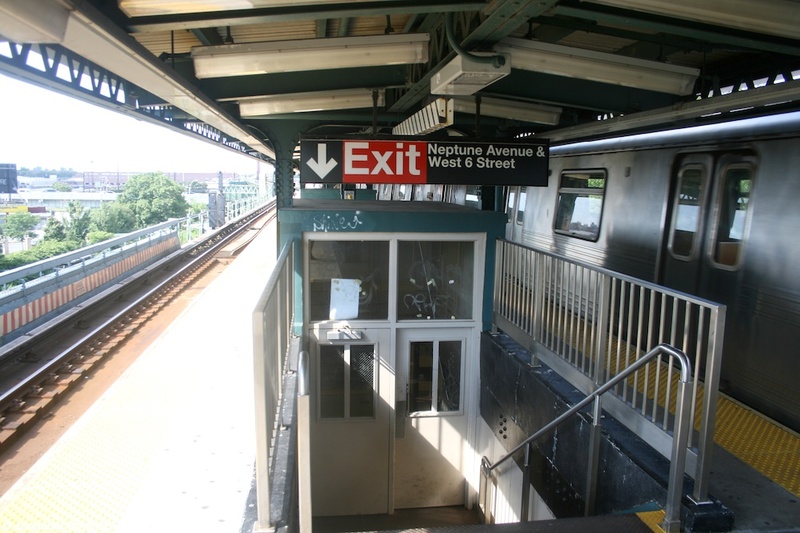 17 August, 2008 (neptunef3) On the island platform between the two staircases that lead down to Neptune Avenue's small station house. 17 August, 2008 (neptunef4) The other end of the portion of the island platform at Neptune Avenue that is canopied. 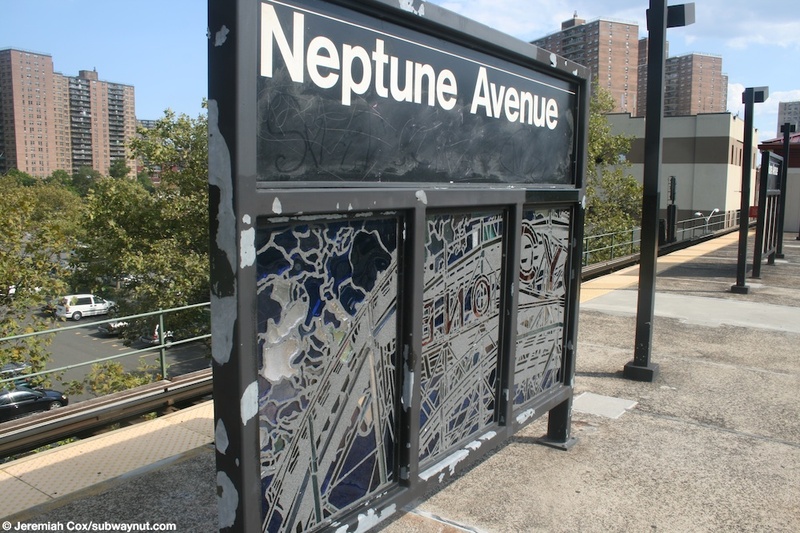 (neptunef5) A small Neptune Avenue sign and platform windscreen, there is stained glass on it. 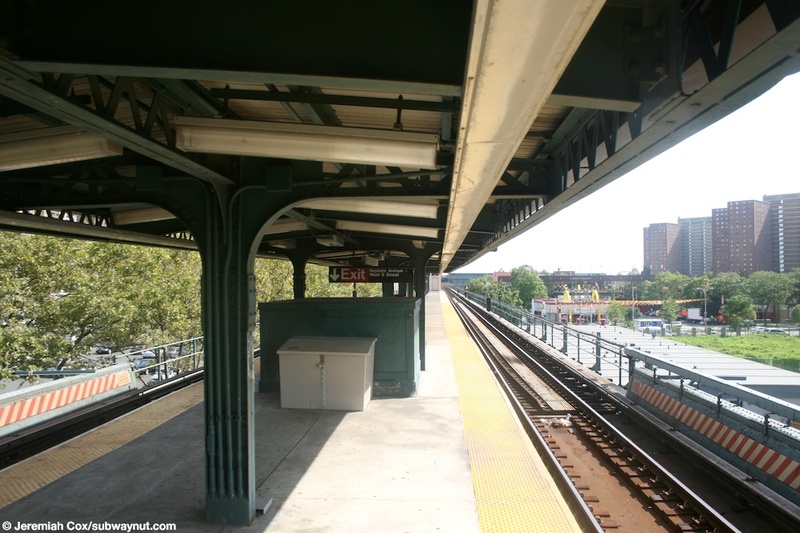 17 August, 2008 (neptunef6) Approaching the southern end of the single island platform that is Neptune Avenue. 17 August, 2008 (neptunef7) Looking down one of the two staircases down to the only exit at Neptune Avenue. 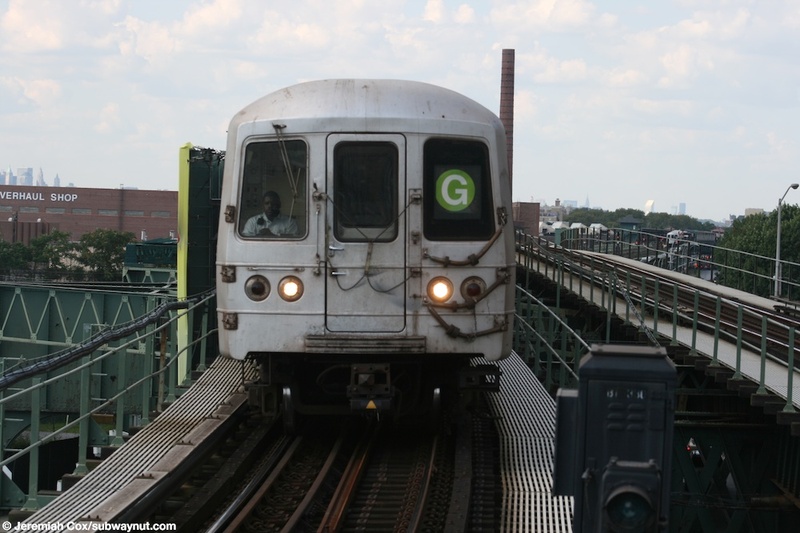 17 August, 2008 (neptunef8) A Queens-bound R46 G train has left Neptune Avenue, it is replacing F train service because of construction. The Empire State Building and a bit more of the Manhattan Skyline is in the backdrop. 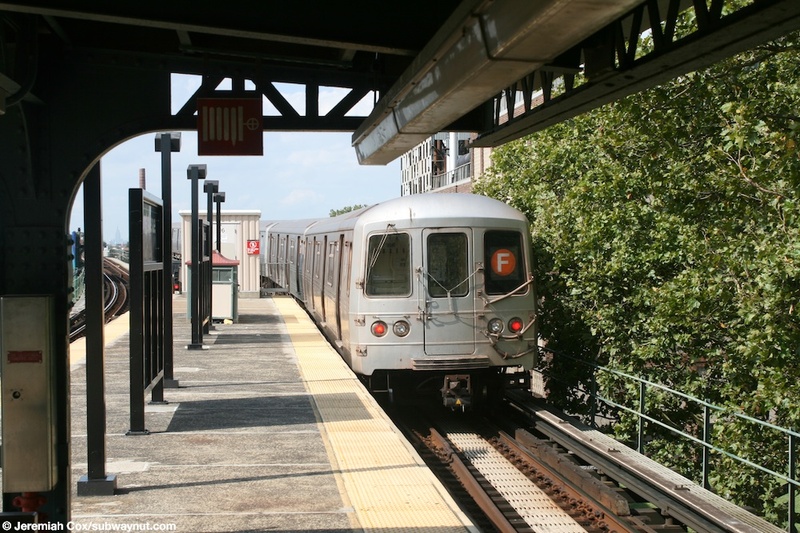 (neptunef9) A Coney Island-bound, 8 car R46 G train (it's that long because its replacing F train service) approaches Neptune Avenue. 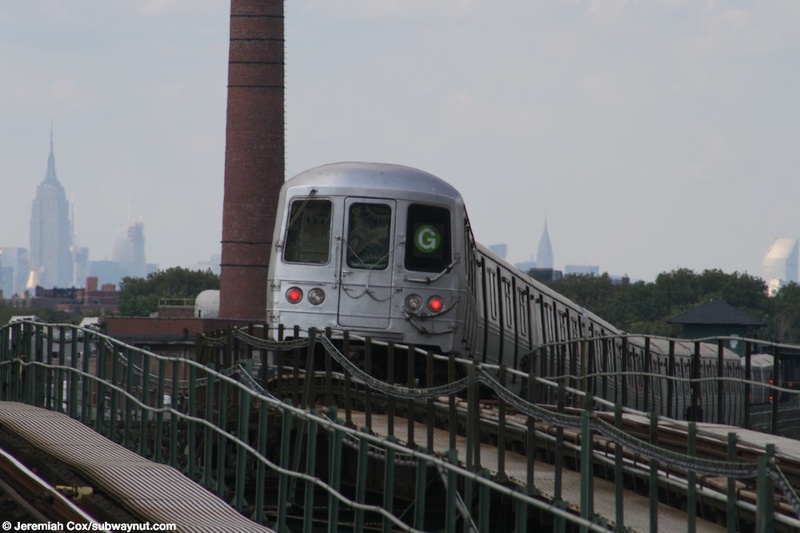 17 August, 2008 (neptunef10) A Coney Island-bound R46 G train is about to enter Neptune Avenue. 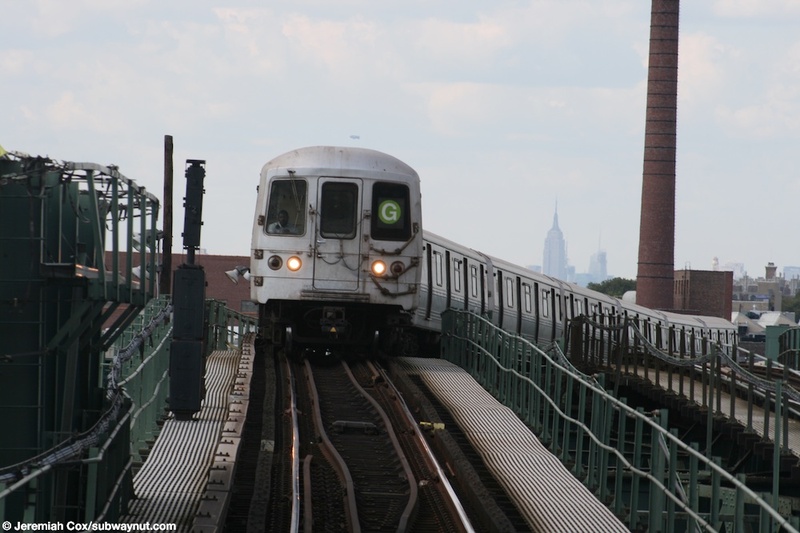 17 August, 2008 (neptunef11) A Coney Island-bound R46 G train goes around the final bend into the Curve into Neptune Avenue, this shot is wider so the Manhattan Skyline looks much farther away but a portion of both the Downtown and Midtown Skylines are visible. 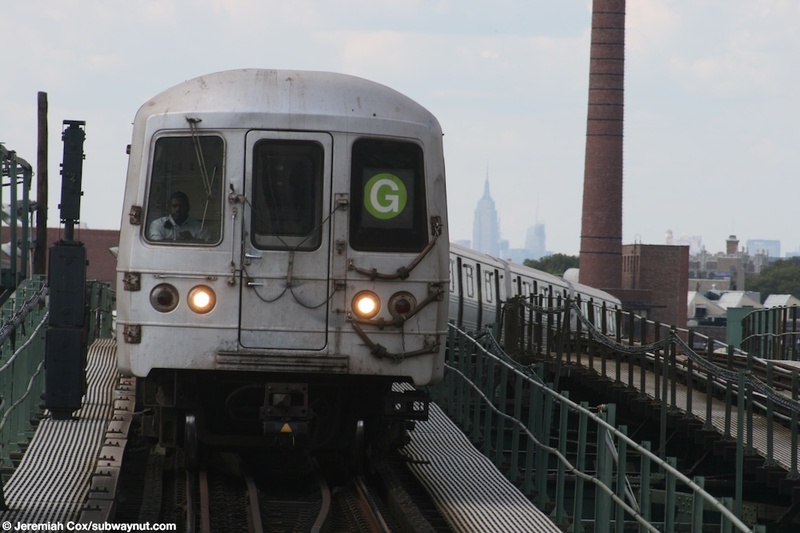 17 August, 2008 (neptunef12) R46 #5683 and a Manhattan-bound F train leave Neptune Avenue. 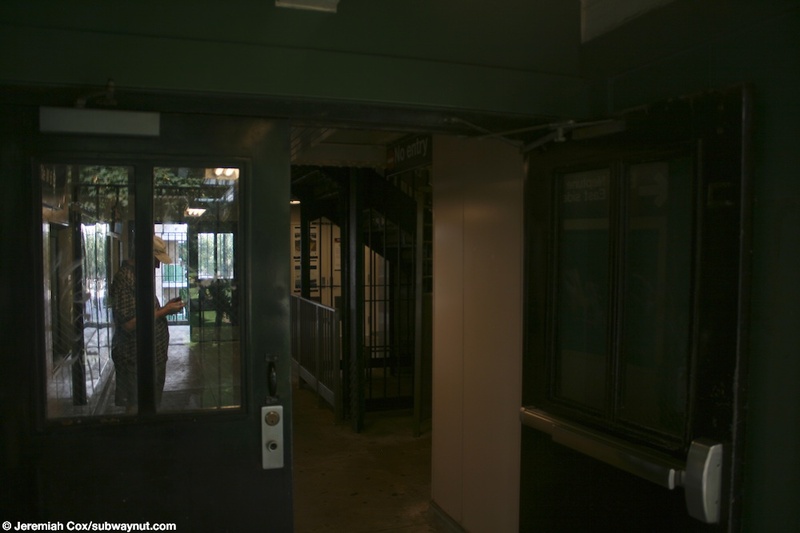 (neptunef13) One of the two staircases down to the stations small headhouse beneath the tracks. 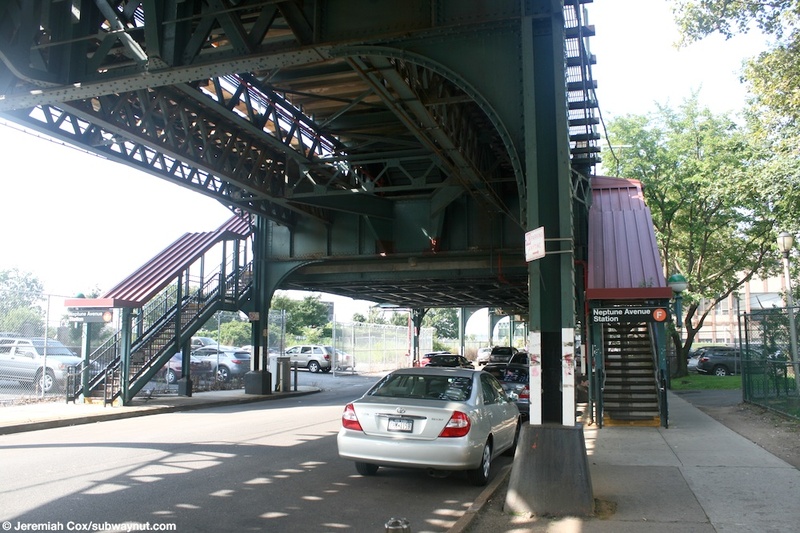 11 August, 2009 (neptunef14) Looking through the doors out to street level from the Neptune Avenue Station house. 11 August, 2009 (neptunef15) The two entrance staircases to Neptune Avenue that come down and off the elevated structure. 11 August, 2009 (neptunef16) A side view of one of the two entrance staircases to Neptune Avenue.